Ron Mason was a workaholic. He spent six, sometimes seven days a week crafting and installing high-quality cabinets and furniture in and around Santa Cruz, California, where he owned and managed a small, homegrown woodworking business. Mason, who describes his product as “high-end, low-volume,” said that for a number of years, putting in a 70-hour workweek was not atypical—it was merely life as usual. In late 2002, all this changed. Mason, at 58, started feeling lethargic at work and at home. His energy level plummeted, and his work suffered accordingly. Mason’s constant and overwhelming sluggishness worsened steadily over the next year. His sleep pattern changed as well: Whereas in the past he would wake up rested after seven hours of sleep, Mason would now regularly fall asleep after work at 5:00 p.m. and wake up at 9:00 a.m. the following day. Despite the seeming overabundance of sleep, Mason’s chronic fatigue continued to worsen. Mason dismissed his symptoms as being stress-related and plodded through the fog of his exhaustion for another year before a friend convinced him to see a doctor two years later. The diagnosis was obstructive sleep apnea, a condition that occurs when tissues at the back of the mouth and within the throat slacken and block the airway during sleep. Sleep apnea affects millions of Americans, according to the U.S. Department of Health and Human Services. The condition can contribute to heart attack, stroke, irregular heartbeat, high blood pressure, impotence and other conditions. While there are three classes of sleep apnea—obstructive, central and mixed—obstructive sleep apnea is by far the most common form. Mason’s doctor referred him to a Santa Cruz sleep disorder clinic, where a diagnostic test of his sleep patterns showed he was constantly moving between unconscious and semiconscious states, meaning that he “woke up” an average of 47 times per hour. Mason says he wasn’t previously aware that he had been sleeping so fitfully, although his partner complained that he often snored heavily and irregularly. His only clue that something was amiss, other than his prolonged hours of sleep, was the gray, emotionless feeling he awoke to each morning. As he had done with his sleep apnea symptoms, Mason tolerated these problems for months, again attributing them to stress and to “a generally unhealthy lifestyle” that included poor eating habits, sporadic exercise and regular alcohol and tobacco consumption. These newer symptoms persisted until Mason finally visited his doctor in February 2005 and learned he had been living with type 2 diabetes and that he needed to dramatically alter his lifestyle if he wanted to avoid a medical emergency. “[The doctor] told me I was a walking time bomb for a stroke or a heart attack,” Mason says. What Mason didn’t know at the time, or at any time, for that matter, until he spoke with a reporter for this article, was that his sleep apnea condition placed him in a group that faces a much higher risk of developing type 2 diabetes than does the overall U.S. population. While experts do not agree on an exact figure, studies have shown that sleep apnea patients are at least three times more likely than other Americans to have type 2 diabetes. Why the High Prevalence of Sleep Apnea in Type 2s? “The unifying factor between sleep apnea and diabetes is obesity in the vast number of cases,” says Arthur H. Friedlander, MD, director of graduate medical education and associate chief of staff at Veterans Affairs West Los Angeles Healthcare Center. In 1999, Friedlander, who also is a professor-in-residence of oral and maxillofacial surgery at the UCLA School of Dentistry, led a study of 54 adult males who had been diagnosed with sleep apnea. The study found that of these patients, 17 were type 2 diabetics. None were aware that they had diabetes. While the exact link between the two conditions is still under investigation, the general consensus is that the more obese a person becomes, the more tissue develops in the throat and at the back of the mouth. Put simply, a person’s risk of airway blockage—and, consequently, developing sleep apnea—increases as the patient grows more tissue in and around the airway. There are, of course, exceptions to the rule: People within a healthy weight range may suffer from sleep apnea if they have abnormally narrow airways or thick tissues in the mouth and throat, recessed jaws or if they suffer from medical conditions that cause congestion in the region. The majority of sleep apnea patients, however, “tend to be very obese,” Friedlander says. Is There a Type 1-Sleep Apnea Connection? Serving as further proof of the correlation between obesity and sleep apnea is the commonly held belief that type 1 diabetics face a much lower risk of sleep apnea than type 2s, as University of Illinois at Chicago researcher James Herdegen, MD, notes. “[Type 1s are] usually not obese, and they tend to be younger, so they probably have a lower rate of sleep apnea,” says Herdegen, an associate professor of clinical medicine at UIC. While obesity is widely regarded as the culprit behind both type 2 diabetes and sleep apnea, experts are still largely in the dark when it comes to proving how, and if, the presence of one of these conditions triggers the development of the other. “We’re not quite sure about that,” says Herdegen. 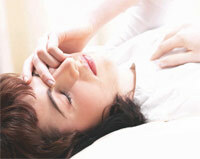 Some evidence, however, suggests that sleep apnea does contribute to heightened glucose levels. As sleep apnea patients fall asleep and the tissues at the back of the mouth and the throat relax, less and less oxygen is able to make it through to the lungs and the bloodstream. According to Herdegen, this decrease in oxygen triggers the body’s “fight or flight” instinct. The patient’s heart rate increases, and a burst of adrenaline is released during these episodes of “sympathetic activation,” Herdegen explains. Results of a recent study led by Herdegen, however, show a popular sleep apnea treatment can help patients suffering from both diabetes and sleep apnea to lower their blood glucose levels significantly. Working with a team of researchers from UIC, Rush University Medical Center and John H. Stroger Jr. Hospital, Herdegen examined the efficiency of “continuous positive airway pressure” (CPAP) in lowering glucose levels in type 2s, and he found there was a significant reduction in glucose levels among patients tested. In test studies, Herdegen says, CPAP helped reduce patients’ hemoglobin A1C levels by an average of 12 percent. CPAP involves wearing a mask over the nose that forces air into the airway during sleep. This constant stream of air pressure, which is customized to fit the severity of a patient’s condition, prevents the airway from closing during sleep. Herdegen says he cannot say with certainty why CPAP lowers glucose levels, but he did offer a theory. Michael Littner, MD, a pulmonologist with the Veterans Affairs Greater Los Angeles Healthcare System, suggested a “speculative theory” in which CPAP’s ability to maintain a steady flow of air through a sleep apnea patient’s airway reduces the amount of adrenaline released. Mason, the Santa Cruz cabinetmaker, began using CPAP soon after learning he had sleep apnea. He says the treatment’s effects took hold immediately. He also says he lost roughly 40 pounds in the five months after he initiated regular CPAP use, although he did little to alter his eating or exercise habits. Mason believes CPAP was largely responsible for the dramatic weight loss, a notion Herdegen seems to believe is possible. “You’d think that it could,” he says of CPAP’s alleged ability to aid weight loss. But Herdegen adds that studies have painted “a mixed picture” of the theory’s credibility. He also notes that most newly diagnosed sleep apnea patients are advised to lose at least 20 percent of their total body weight, so isolating the direct effect of CPAP on weight loss is a difficult task. Littner took a dimmer view of the CPAP weight-loss theory, calling it “unlikely” that CPAP in itself would help a patient shed pounds. In any case, most people with sleep apnea aren’t even aware they have a condition at all. While between 4 and 5 percent of Americans suffer from obstructive sleep apnea, only one-tenth of these people have been diagnosed, Herdegen says. He recommends that anyone experiencing chronic fatigue, excessive snoring, irregular sleep or other sleep problems visit a physician. Aside from CPAP, which may cause nasal congestion, stuffiness, discomfort and other side effects, there are a number of surgical options for sleep apnea patients seeking a cure. Treatment for sleep apnea includes lifestyle changes, continuous positive airway pressure and surgery. The goals of treatment are to relieve symptoms such as snoring and excessive daytime sleepiness and to prevent other problems, such as high blood pressure. Your doctor will base your treatment on how severe your sleep apnea is. Illinois researchers say that sleep-disordered breathing is “pathophysiologically related to impaired glucose homeostasis.” They add that continuous positive airway pressure (CPAP) can be an important therapeutic approach for diabetic patients with sleep-disordered breathing. Nasal CPAP delivers air into the airway through a specially designed nasal mask or pillows. The mask does not breathe for you; the flow of air creates enough pressure when you inhale to keep your airway open. CPAP is considered the most effective nonsurgical treatment for the alleviation of snoring and obstructive sleep apnea.